The AXIS 5400 and AXIS 5600 print servers are designed to improve printing performance, increase network flexibility, and extend the life of your printer investment. Based on revolutionary ThinServer Technology, the AXIS 5400 and AXIS 5600 print servers provide the features, protocol support and compatibility expected from a leading manufacturer in the print server industry. The AXIS 5400 and AXIS 5600 print servers are capable of maximizing the full potential of your printers with a benchmarked performance of over 1Mbyte/s in a NetWare environment. 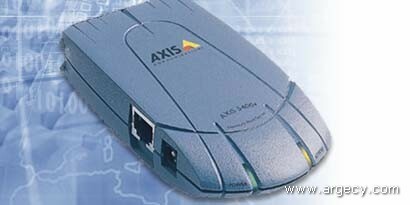 Both print servers are based on Axis new ETRAX 100 chip, the new platform for all Axis networking products. AXIS 5400 and AXIS 5600 print servers are future-proof. They have the speed, ease of use, and upgradeability needed to keep up with the faster, higher quality printers of today and tomorrow, and are optimized for performance on either 10baseT or 100baseT networks with advanced TCP/IP support and extensive NetWare support. And both print servers auto-negotiate between 10baseT and 100baseT network speeds. The AXIS 5400 and AXIS 5600 print servers are compatible with all parallel printers, including printers from Canon, Epson, HP, IBM, Lexmark, Ricoh and Xerox. Axis print servers are so reliable, the company provides a robust three-year warranty and free service/support. Best of all, the AXIS 5400 and AXIS 5600 have a MTBF (Mean Time Before Failure) of more than 20 years. With high compatibility and reliability, the print servers are ideal for networks migrating from 10 Megabit Ethernet to Fast Ethernet. AXIS ThinWizard is a major step forward in the management of all ThinServer products. It is a Web-based device management tool built using Java technology. AXIS ThinWizard allows multiple ThinServer products to be viewed and managed in a group or groups using a standard Web browser. NetWare 3.11, 3.12, 4.10, 4.11, 5 and above. Supports bindery emulation and NDS. Up to 16 bindery file servers and 96 print queues are served. BSD systems: BSD 4.2, 4.3, 4.4, SunOS4 (SOLARIS 1.x), DEC Ultrix etc. AXIS NetPilot utility included with Wizard. Installation script resident in memory. Use of IEEE802.2, IEEE802.3, SNAP and Ethernet II frame types simultaneously. The AXIS 5400 supports 1 36-pin Centronics connector parallel port and the AXIS 5600 supports 2 25-pin DSUB parallel ports all of which are high-speed IEEE 1284 compliant. 2 LED indicators: Power and Network.